He says it makes him happy. Rob Dekany, known locally as Uber Rob, ferries stranded passengers at Darlings Island, N.B. on May 3, 2018 as the Kennebecasis River flooded the only road into the community. 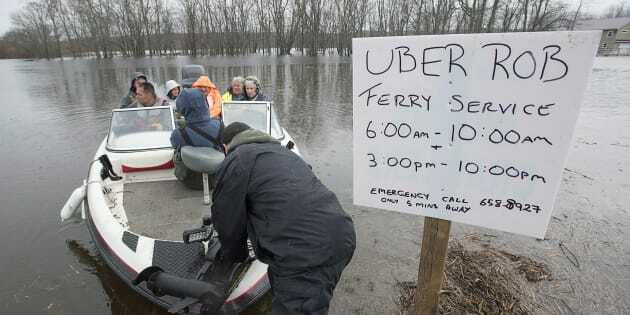 FREDERICTON — Record floods have brought chaos to a large swath of southern New Brunswick — with key highways shut and many residents forced from their homes — but they have also produced local heroes like "Uber Rob." Rob Dekany has since Monday been ferrying seven passengers at a time to Darling Island, a Saint John-area island where the only access road has been submerged by the flood waters of the Kennebecasis River. There's even a schedule posted on a makeshift "Uber Rob" sign at the edge of the water. But Dekany has refused to accept any payment. "He's our saviour," Patty Johnston said as she stood in the rain, waiting to cross choppy, debris-filled waters to get to her home. He has made the trip a few times an hour to get people off the island in the mornings, then returning them each afternoon and evening. Dekany said the profits he makes from a lucrative worm business allow him to give back to the community. Doing it makes him happy, he said. "As you can see I've got a bunch of good people here and thought I'd give a hand in good faith and as a good Samaritan," Dekany said as he prepared to take another load of people to the island. He has become a symbol of New Brunswick's resilience and neighbourliness, even as heavy rain overnight only added to the misery of many people sandbagging their homes in an effort to hold back the rising waters. In Saint John, the worst is likely yet to come. Geoffrey Downey of the Emergency Measures Organization said Friday the Saint John River has hit 5.5 metres above sea level in Saint John — water levels not seen since 1973 — and will likely exceed that on Saturday when forecasts say it could reach 5.9 metres. The Trans-Canada Highway connecting Fredericton and Moncton was closed to traffic late Thursday because flood waters have crossed the four-lane highway in the Jemseg area. Jean-Marc Picard, executive director of the Atlantic Provinces Trucking Association, said the closure will force a lot of trucks onto alternative roads, and asked motorists to be alert and patient. A resident heads home at Darlings Island, N.B. on May 3, 2018 as the Kennebecasis River flooded the only road into the community. Picard said the detour is adding fuel costs and an hour or more to trip times. "We're pretty resourceful in terms of adjusting operations and making the necessary adjustments to the drivers' daily deliveries," he said. "For sure the longer it's closed the more impacts it's going to have ... but at least there's an option." Downey said the rising Saint John River is causing more people to evacuate in areas stretching from Fredericton south to Saint John, which is expected to worsen in the coming days as rain is in the forecast. "People are heeding the evacuation notices, which helps a great deal that you don't have to send people and resource power to go get people in dangerous situations," he said, adding that it is a dynamic, record-setting situation. "We're reacting. We can't rely on previous experience, which is tough. We're having to evaluate these things as they come along with no previous experience." About 273 households affecting 671 people had registered with the Canadian Red Cross as of Friday morning. "That by no means represents the number of people who have evacuated because not everybody who does that knows or thinks to call the Red Cross," said Bedell. Downey said officials are helping arrange sandbagging efforts, with hundreds of thousands of sandbags having already been filled. In Grand Bay-Westfield, Kathy Gilmore and a group of neighbours were filling sandbags to protect her home. The water was still a few feet away from her foundation, but she didn't know how much higher it would rise. "I've heard so many numbers," she said. "It could be another three feet." The Fisheries Department was using boats Thursday to patrol Grand Lake and the various communities that surround it, as they looked for anyone who needed to be evacuated to safety. About a dozen cottages were half submerged in water, while sheds, propane tanks and other items bobbed in the water or hit the shore with each wave.